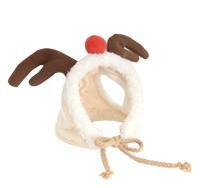 Cute for Fancy Dress Parties, Halloween and especially Christmas, the Puppy Angel Rudolph the Reindeer Dog Cap is tons of fun! Made from supersoft tan fabric the cap is trimmed in textured fleece while two plush antlers and Rudolph's famous nose adorn the top! Two holes at the back of the cap house your dog's ears and the cap fastens under your dog's chin with the little ropes attached to either side.